Doing my homework for color theory class this week, I discovered I had made the sort of thing I had always admired. It’s a great feeling , to look at your own work, and say, “Hey, that’s how you do that!” and see that you just did. 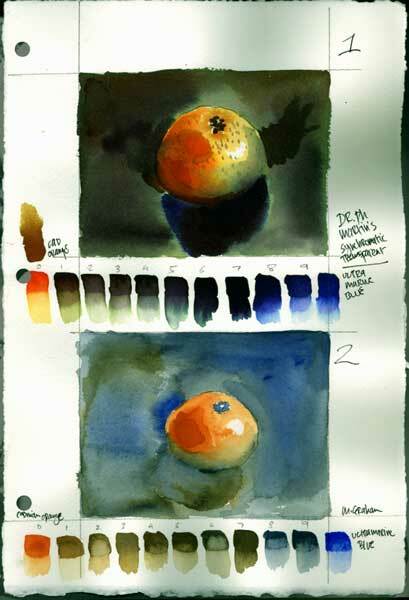 The thing I made was not just a watercolor of an orange – but a page with little swatches of color and handwritten notations that, as a composition, captured the process I went through in making the picture. There’s a fair amount of carelessness in the whole thing which evokes the way I was working but there’s also a progression that shows how I was learning and experimenting. This is the tip of the iceberg of what I am realizing is my aesthetic. I have always been very drawn to notebooks and diaries and I see now that this is primarily because of the way they look. When I was a kid, I was a big fan of Gerald Durrell and wanted to be a naturalist or a vet. I also loved drawing maps and making books. Perhaps that’s where this taste for logs and sketches and Latin names first began. I remember going to an exhibition of diaries at the Morgan Library a few years ago and there was a huge book that contained a captain’s log, kept in the 18th century. The book was open to a spread that contained a painted map surrounded by spidery calligraphy. I could feel the voyage in those two pages, the creaking of the ship at night as the captain filled in his log and drew the map. Field manuals kept by botanists and naturalists also have this palimpsest aesthetic; that’s part of why I love the work of Richard Bell, Roz Stendahl and Hannah Hinchman. Not just a report on nature but nature itself invading the report, smudges and fingerprints, taped-down specimens, random thoughts inspired by the moment, teeny gestural sketches surrounding a carefully rendered drawing. My old pal, Walton Ford, does this to a T, making enormous, spectacular watercolors that evoke 19th century explorers and are meticulously rendered. His work has put me to shame since we met at sixteen. I am in full sympathy with Bill Gates for paying as much as he did for Leonardo’s Codex, not just because it contains the discoveries of one of the greatest minds to ever ride around on human shoulders but because of how beautiful it as, the sepia drawings, the mirror handwriting, the thick parchment pages. When I was in college, I knew a rather crafty fellow named Brody Neuenschwander who was pursuing a course of independent study, hand grinding his on pigments and illuminating manuscripts. I’m not sure where such a major ultimately lead him, though he did do the calligraphy in a few Peter Greenaway movies, but what a wonderful way to spend your time. I have always liked Peter Beard’s diaries; for a couple of years he had his work on display in SoHo and we went many times to look through his huge diaries, filled with photocollages and the phone numbers of his famous friends. I also love architects’ plans, those perfect sketches, wonderfully strange lettering, elevations and notes and marginalia. You can feel the ideas unfolding. And skritchy scratchy dip pens like the ones Ralph Steadman uses, spraying inkblots all over the words. (I’ve never been that much of a fan of Nick Bancock’s work. I find his stories muddled but worse of all, it’s all artificial and seems like much of it was computer generated to simulate real letters and postmarks and the like). I have a big collection of old diaries, ought at flea markets and on eBay and best of them, particularly the travelogues, have this layered, lived-in feelings that is wonderful. The same goes for collections of old letters, stacked and tied with faded ribbon. Of course, computers threaten this aesthetic. Biologists and naturalists, explorers and cartographers use laptops now and everything is rendered on the web. Fat chance that there will be musty piles of old servers found behind cobwebs or that this blog will be enshrined in a dusty vitrine some day. your artworks are amazing ,i am fanatic about it .i am studying animation at china now , i see lot of your sketches are painted by water color ,so do you carry a tool box containing watercolor,brushes,and everytime you go out and painted on street ? ?